Etienne Schneider (Luxembourgish pronunciation: [ˈʃnɑɪ̯dɐ]; born 29 January 1971) is a Luxembourg politician and economist of the Luxembourg Socialist Workers' Party (LSAP). He was a municipal councillor in Kayl from 1995 to 2005, and from 1997 to 2004, he was secretary general of the parliamentary group of the LSAP in Parliament. He was elected first alderman of the municipality of Kayl in 2005, a mandate he held until May 2010. Schneider was appointed Minister of the Economy and Foreign Trade on 1 February 2012. In the government formed following the 2013 Luxembourg general election he is Deputy Prime Minister and Minister of the Economy. He continued to hold these offices following the 2018 Luxembourg general election, where he became the health minister too. From 2013 to 2018, he served as Minister for Defence. Following the 2018 Luxembourg general election, he became the first openly gay politician to be reelected for the office of deputy minister. Born in Dudelange, Schneider completed his secondary schooling at the Lycée Technique d'Esch-sur-Alzette before studying at the ICHEC Brussels Management School and at the University of Greenwich in London where he graduated in business and finance in 1995. In 1995, Schneider became a councilor in Kayl, a post he maintained until 2005, subsequently becoming first alderman until 2010. In 1997, he was appointed secretary general of the Luxembourg Socialist Workers' Party (LSAP) until he became chairman of the board of the electricity utility Cegedel, subsequently becoming chairman and Managing Director of the German energy company, Enovos (a grid company), the creation of which is also credited to him. Schneider was also a research assistant at the European Parliament in Brussels between 1995 and 1996. In the Kayl municipal elections in 2005 he was elected as first alderman of the municipality which post he occupied till May 2010. During 1997, he worked in Brussels as a project leader with NATO. 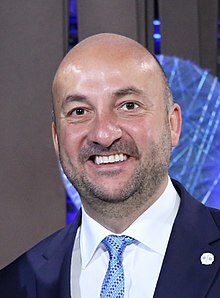 In 2010, he also became chairman and managing director of Luxembourg's Société Nationale de Crédit et d'Investissement but resigned all his business appointments when he became Minister of the Economy and Foreign Trade in February 2012, replacing Jeannot Krecké. In this capacity he also co-chaired the Superior Committee for Research and Innovation. His tasks as minister involved private sector research and implementation of the bill of 5 June 2009 relating to assistance in the field of research. Although Schneider was frontrunner as the leader for the LSAP in the general election on 20 October 2013, he received only 19,683 votes, far fewer than Jean Asselborn, also an LSAP candidate, who had 38,257. In the new coalition, he has been appointed Deputy Prime Minister and Minister of the Economy. He is openly gay, and married his husband Jérôme Domange in 2016. As Minister of Economy Schneider has expressed his support for the space program currently taking place to mine near-Earth asteroids in a statement, also mentioning the environmental benefits for mining off Earth. He continued to hold these offices following the 2018 Luxembourg general election, where he became the health minister too. From 2013 to 2018, he served as Minister for Defence. Following the 2018 Luxembourg general election, he became the first openly gay politician to be reelected for the office of deputy minister. ^ a b c d e f "Biography of Etienne Schneider". Gouvernement.lu. Retrieved 20 October 2013. ^ "Etienne Schneider appointed as new Minister of the Economy and Foreign Trade". Erawatch. Retrieved 23 October 2013. ^ "Juncker the most popular candidate – receives 55,968 votes", Wort.lu, 21 October 2013. ^ Fatima Rougi. "Qui sont les 18 membres du gouvernement?" (in French). L'Essentiel. Retrieved 5 December 2013. ^ "Luxembourg to become first country to have gay prime minister and gay deputy PM". PinkNews. Retrieved 20 December 2015. ^ "Etienne Schneider: Luxembourg Deputy PM ties the knot". 2 November 2016. Retrieved 13 December 2016. ^ "Luxembourg, running out of Earth to mine, looks further afield". ABC News. 2016-02-04. Retrieved 2017-10-08. Wikimedia Commons has media related to Etienne Schneider. Jacques Santer is a Luxembourg politician who served as the 9th President of the European Commission from 1995 to 1999. He served as Finance Minister of Luxembourg from 1979 until 1989, and the 20th Prime Minister of Luxembourg from 1984 to 1995, as a member of the Christian Social People's Party, which has been the leading party in the Luxembourg government since 1979. As Prime Minister of Luxembourg he also led the negotiations on the Single European Act, which effectively set aside the 20-year-old Luxembourg Compromise. General elections were held in Luxembourg on 13 June 2004, alongside European Parliament elections. The ruling Christian Social People's Party (CSV) of Prime Minister Jean-Claude Juncker won the election, increasing its number of seats to its highest since before 1989 and its share of the vote to levels not seen since the 1959 election. The Greens is a green political party in Luxembourg. Mars Di Bartolomeo is a Luxembourgish politician. Jean Asselborn is a Luxembourgish politician who has served in the government of Luxembourg as Minister for Foreign Affairs since 2004. He also served as Deputy Prime Minister from 2004 to 2013, under Prime Minister Jean-Claude Juncker. Early general elections were held in Luxembourg on 20 October 2013. The elections were called after Prime Minister Jean-Claude Juncker, at the time the longest serving head of government in the European Union, announced his resignation over a spy scandal involving the Service de Renseignement de l'Etat (SREL). The review found Juncker deficient in his control over the service. General elections were held in Luxembourg on 14 October 2018. All 60 seats of the Chamber of Deputies were elected.